At the present time, natural stone can be worked in many different ways and, consequently, several finishes are available so as to create beautiful and original atmospheres. The wide range of textures offered is proof of the versatility and adaptability of the material. Bateig natural stone features a high degree of homogeneity due to the fact both its mechanical properties and appearance colour remain unchanged over time, even after the application of some techniques to guarantee select and beautiful finishes. Bushhammered. One of the most classic and traditional finishes. It mainly consists on little holes of 1-3 millimetres depth, which are spread uniformly over the natural stone surface. Its appearance is normally characterized by a rough and uniform surface. Heavy bushhammered. This finish consists on an even more rough and pockmarked texture, which resembles naturally weathered stone. Its appearance, therefore, is rough and matte. Split face. It offers a uniquely textured stone. The process consists on splitting or breaking the material so as to give the rock a rough and rustic look. Antique. To produce this texture is necessary to apply some chemical and abrasive products over the stone surface. The end result is a slightly rough surface with a glossy appearance. Sandblasted. As its name suggests, its look resembles the sand. It normally consists on a slightly scratched surface and its final appearance is characterized by its uniformness. Striated. Made with specific machinery, the striated finish normally features a matte surface as a result of the process. Furthermore, it is also important to emphasize that natural stone is a limitless material whose properties enable to produce any kind of design. In Bateig, we are used to working the stone so as to recreate any design the customer may need. Thanks to our CNC machines, we are specialists in this kind of works. The end results are stunning in any of its applications: walls, facades or even decorative and ornamental elements. 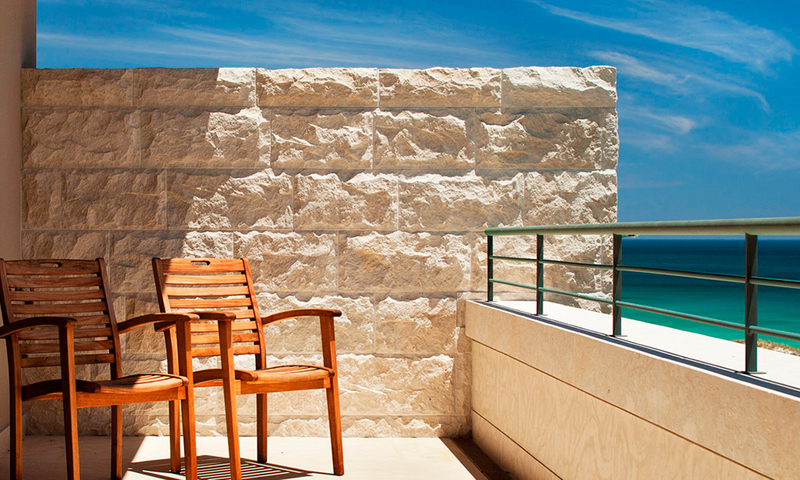 Bateig natural stone finishes are completely able to bring originality and novelty to every place you may dream of.